The first true incarnation of "Little Green Men" is now available in this 3:4 Scale rendition by Executive Replicas. Prototype was sculpted by Steve West and paint master was painted by none other than Steve Riojas. Each numbered of only 200 produced! Measuring about 16 inches tall, your little green guy is really quite sizeable and loaded with great detail. 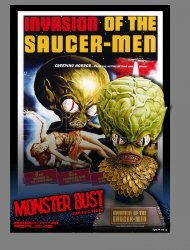 From the scales covering his chest to the veins running through his bulbous green head, the Invasion of the Saucer-Men 3:4 Scale Bust is out of this world. Limited edition of 200 pieces worldwide, the bust is hand-numbered on the base. Packaged in full-color box. Licensed and authorized by Susan Nicholson Hofheinz 2011. Collector's Note: Some assembly required. To display this bust, the head must be set into a middle piece which sets onto the base and may be secured into place if desired. External manufacturer's shipping carton is thin-walled soft cardboard and as a result the internal packaging box will show box dings/dents or push-ins from original shipping from manufacturer. We are not responsible for manufacturer defects in paint or casting of the actual bust as each is individually cast, molded and hand painted. Important Shipping Note:To purchase this item you must choose your desired shipping service in the drop-down menu above as well as in the shopping cart. Priority Mail shipping in the U.S. requires a DIM weight surcharge due to the size and weight of this package. Double-boxing or extra cardboard wrap available at added cost -- contact us before purchase.